Pretty simple bento for today. Inside the blue box : pan fried fish fillet with light soya sauce, steamed chayote, flower carrots, grape tomatoes, and corn. 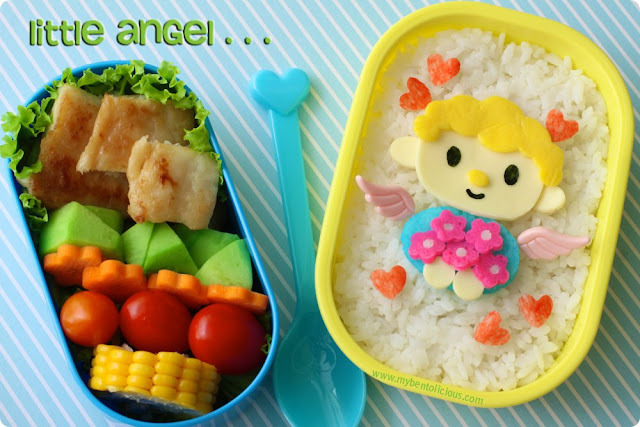 Inside the yellow box : rice decorated with little angel. I added wings from my new food picks and other parts of little angel were cutting from egg sheet, cheese, kamaboko, crab stick with various of cutters. Oh my... that must of been quite a scare for your sister! So glad that Brandon is doing better now. What a nice tribute to your little nephew by creating this cute angel. The little blue bento's fillings are very healthy and looks yummy too. lia that's so scary about brandon! thank goodness he is ok, you and your family (esp. your sister!) must be sooo relieved. the angel is such a sweet protective wish for him, and so beautifully done. i love the bright colors and the tiny flowers and hearts! @hapabento : Thanks a lot Debra! Hope nothing scary will happened ever again to the twins. @megan : Thanks a lot Megan! The twins are the fighter and I believe they will doing great in the future. Glad that Brandon is well now! This bento is simply precious. *sigh* And I love the layering of colors in the blue box too. That steamed chayote intrigues me. I'm going to bed now, so goodnight Lia! Oh my! How shocking to read about poor Brandon. I'm also glad that he is fine now. I'm sure god watches now better over him, because of your cute little angel. I love it. The tiny hearts are so adorable ^-^ You have always great ideas! Lia, the angel is soooooooooo lovely! Hope Brandon is all active again! The fact that little Brandon pulled through is clearly a sign that he has a little angel watching over him. I'm sure though the guardian angel is wishing he looked as lovely as how you portayed him. You made a lovely bento to honour him and I'm glad that Brandon is fine now. Saya tebak ya, wajah Brandon pasti se-imut lil' angel di bento ini. I'm sure GOD will blessed Brandon and your little angel will be at his side to protect him. Lia, your Angel is so sweet and beautiful! All of those pretty colors and the bento looks delicious! Thank God that little Brandon fight through it! Hope your little angle will always be with the family. Such a lovely angle! omg, this is way cool. I am so glad Brandon is well! With you as his Auntie, he has a guardian angel for sure! Beautiful bento with a very special and personal meaning...thank you for sharing this and the story behind it's making! @Melanie : Thanks a lot Melanie for the nice comment! @Bento Box : Thanks a lot for the kind comment!